This should be the main event of the meet with 2-time 800 champ TiCoiya Gidderon (High Point Central), 3A 1600 State Champ Elise Wright (T.C. Roberson), Georgia 5A 800 State Champ Emoni Coleman (Tucker HS), plus 7 other girls under 2:20! The hope for these girls is to challenge 2:10 with Gidderon holding a PR of 2:11.93, Coleman 2:12.50 and Wright 2:12.75. Olivia Bene (Northern Guilford), Katie Verrill (Piedmont) and Alyssa Hernandez (Northern Guilford) also will pose as threats. Hernandez was the 3A 400m runner-up, but we saw her throw down a nasty first leg of Northern Guilford's 4x800. Bene finished just behind Wright who was runner-up in the 3A 800 to Megan Marvin in 2:13.76. This is by far the deepest 800 in North Carolina this outdoor track season. 30 boys are entered at sub 2:00 and 1:57.13 is the slowest time to make it into the fast section. 3A State Champion Kyle Durham enters with the fastest seed of 1:53.98, and he'll face off with a Green Hope trio of Ares Epps, Matthew Kehn and Sean Petersen, who have all be sun 1:55 this season. Epps has run 1:53, but was DQed in the race at the SWAC Conference Championships. He also split 1:51 for the Falcons at Penn Relays on the opening leg. Durham won the 3A 800 in his 3rd event of the day after anchoring the 4x800 and taking 4th in the 1600 earlier in the day. The race will also feature 1:55 man Zach Beale, who had his big breakout performance on this track back in April at the NCRunners Elite Invitational, where he upset a strong field. Chapman Fitzgerald (Cary Academy) won the NCISAA 3A 800 in 1:55.32 out of the slow heat! What will Fitzgerald be able to do with a lot of confidence against a strong field? NCHSAA 3A State Champion Dahlia Cutler (Cuthbertson) is fresh off a big PR of 56.15 where she edged Alyssa Rodriguez at the line to bring home her first individual title. Ella Mainwaring Foster (Providence) took 3rd at the NCHSAA 4A State Championship in the event and holds a PR of 56.20 as a sophomore. These two should be able to push sub-56 in a head to head battle. Abriel Myers (Stratford, SC), Florah Henry (Cuthbertson) and Trinity White are also slated to compete. 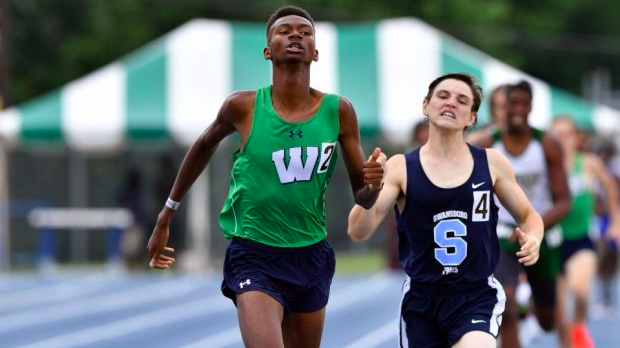 Ares Epps (Green Hope) and Sean Petersen (Green Hope) will double back from the 800 and will battle it out with Wynn Johnson (Dorman), Coleman Mitchell (Cary Academy), and West Virginia State Champ Aaron Withrow (Winfield). Johnson enters with the best PR of 4:15.92, and is fresh off a 1:55 800m run last weekend. Mitchell was the NCISAA 3A 1600m Champion where he ran 4:21.85. His PR comes from last year of 4:18.72. Jackson O'Hara (Weddington), Jason Thomson (North Lincoln), and Tim Haughton (Apex Friendship) will also look to crack 4:20 in this loaded 1600. Ariana Rivera (Providence) ran a new NC#1 time of 1:01.69 last weekend in Georgia in her premier event. Rivera is also coming off a runner-up finish at the NCHSAA 4A State Championships in the 300m Hurdles where she ran a PR of 42.44. Anna Brewer (Fort Mill, SC) will be a big threat to Rivera with a PR of 1:02.23 in the event. Brewer was the SCHSL Runner-Up in the event three weeks ago. Olivia Cooney (South Iredell), Nimeesha Coleman (Providence) and Taylor Arthur (Ardrey Kell) will also be in the event. NCHSAA 4A State Champ Carmen Alder (Pinecrest) has been unstoppable this season with a 1600 PR of 4:56.47. Alder has not raced NCHSAA 3A Champ Elise Wright yet this season, who is likely Alder's biggest competition in the state. Wright will be doubling back from the 800, and has a PR of 4:57.80 in the event. Eliza Broce (West Forsyth) was 5th at the NCHSAA 4A State Championships and has a seasons best of 5:03.94 in the 1600. Broce has had an incredible freshman year, just a bit overshadowed by Alder's dominance. Ainsley Cooper (Reagan) is coming off a great state meet where she anchored the 4x800 to a 2nd place victory, took 4th in the 1600, then 2nd in the 3200. Cooper holds a season best of 5:04.92, and will look to crack 5 minutes tonight.